At the rear of the park, paralleling the river, Riverview began construction of the Marine Causeway, also known as the River Walk. 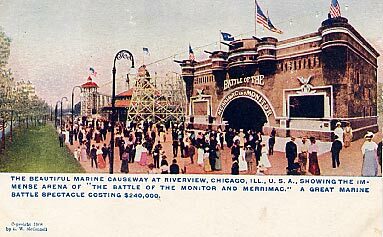 During 1907, very little was on the Causeway, but during the 1908 season, Riverview added the sensational attraction, Battle of the Monitor & Merrimac, which was a re-creation of the famous Civil War naval battle. 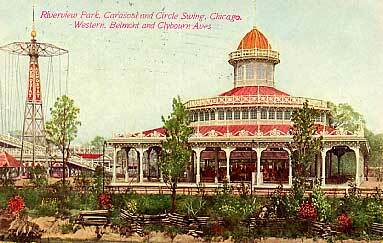 Also added in 1908 was a magnificent 5-row carousel, one of the largest ever built! 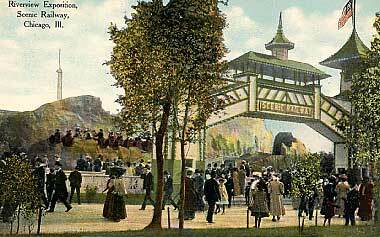 The Pikes Peak Scenic Railway was also added in 1907. See picture below. 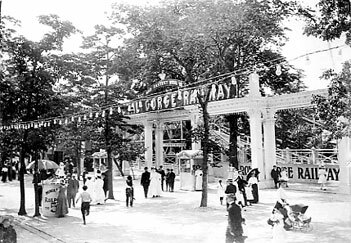 In 1908, Riverview added two more roller coasters, the Aerial Coaster, which wrapped around the Monitor and Merrimac building, and the Royal Gorge Scenic Railway. The Aerial Coaster, also known as the Pottsdam Railway, can be seen above on either side of the Monitor and Merrimac. The Royal Gorge Scenic Railway is below at right.